ANCOR Duplex Cables are made to surpass the highest UL Boat Cable standards with ultra flexible (Type 3/Class K) stranding to resist fatigue due to vibration and flexing. Tinned copper stranding for maximum protection against corrosion and electrolysis. acid, oil, gasoline and ultra-violet radiation. Exclusive insulation is rated at 600 volts, 105° C dry and 75° C wet, and is resistant to heat and abrasion. 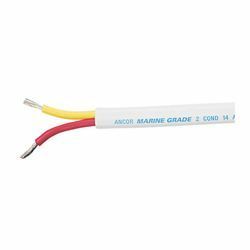 Features red and yellow Marine Grade primary conductors in a white common jacket. Ancor's boat cable exceeds all UL 1426, USCG charter boat and ABYC standards. ABYC Recommends using Yellow Wire for your DC negative because Black Is the standard color for AC hot. There Have been many cases of people working On their electrical systems who have Inadvertently cut into black AC wires. This is becoming even more common even On small boats due to the widespread use of inverters, power generators and Shore power connections. Duplex Safety Wire has inner conductors of yellow and Red for safety.